Emerging from the layers of salt! 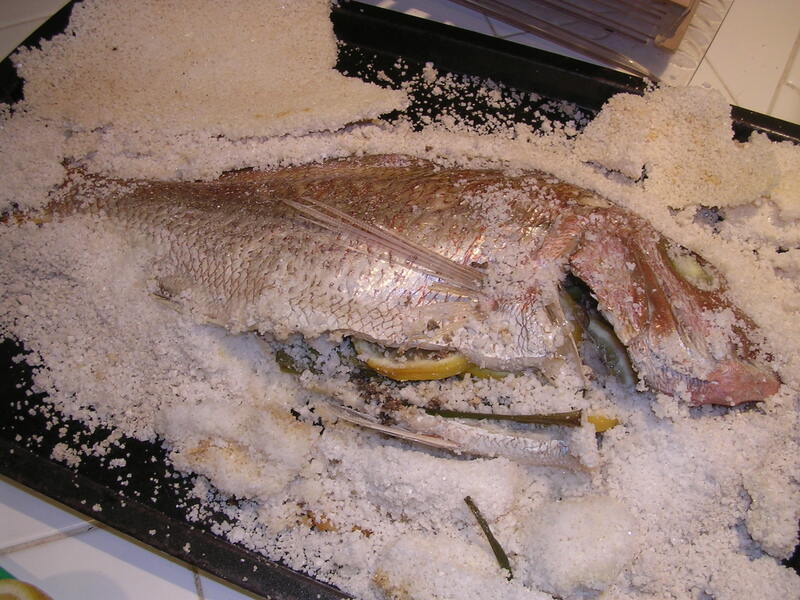 Baking a fish in salt is, hands down, the best way to roast a whole fish. The fish is always amazingly moist and easy to filet, and not overly salty despite what you'd expect from being encased in salt. It's quick too. We get our whole fish at the Chinese fish markets here in San Francisco; most large cities have good Asian fish markets, which typically have good fresh fish at reasonable prices. Whole Foods also usually has high-quality whole fish on hand. Rinse the fish with cold water and pat it dry with paper towels. On a large rimmed baking sheet, roasting pan or baking dish large enough to hold the fish, pour an even 1/2-inch bed of salt for the fish (leave about an inch of extra salt beyond the fish's outline). Lay the fish on the salt and stuff the cavity with the lemon slices, garlic and green onion. Carefully pour the remaining salt over the fish, gently using your hands to encase the fish entirely in salt. Try to be sure there is at least 1/4 inch of salt covering every part of the fish. Place the fish in the oven and bake for 30-40 minutes (depending on the thickness of the fish). Remove the pan from the oven and let the fish rest, undisturbed, for 5 minutes. Carefully brush away the salt or, if it has turned into a crust, break it off in pieces. Using a couple of wide spatulas, lift the whole fish to a large cutting board. To remove the top filet, start by peeling off the skin, which should come off easily. Using a spatula, lift away the filet from the bones moving from the top or spine of the fish towards its belly (it should lift off the spine and rib bones easily, but there will probably be a few pin bones remaining in the filet that you'll have to pick out individually). Then remove the bottom filet by first lifting off the fish's spine and bones, grasping the tail and gently lifting towards the head; the spine, rib bones and head should come off in one piece. You'll then have the whole bottom filet, free of most bones, waiting for you. Note that if you look carefully in front of the fish's gill flaps on the head, you'll find the fish's cheeks -- little delicacies! Drizzle juice from the reserved lemon wedge over the filets and serve.